Brooklyn Basin is the name of an in-progress building project on the waterfront next to Jack London Square. This is the largest new building development in Oakland in half a century! The project is estimated to cost over $1bn and is being primarily financed by Zarsion Holdings Group of China, in partnership with the Oakland-based Signature Development Group. The first phase of the project broke ground March 13, 2014 and it's expected to be completed within three to four years. Spread out over 64 acres, it will include 13 buildings of housing, with 60% to 70% for sale and approximately 465 units below market rates. The housing will be a mix of 3,100 apartments, condominiums, loft spaces and townhouses. Computer rendering of the development (from East Bay Express)In addition to the housing, there will be 200K sq. ft. of retail space, along with renovation of the Clinton Basin and 5th Avenue Marinas. 50% of the proposed project would be open space, including 32 acres of new city parks, including wetlands restoration. The majority of the 9th Avenue Terminal building will be demolished, with only a small part preserved as a maritime museum. Jerry Brown & Jean Quan have both worked to make this project happen. 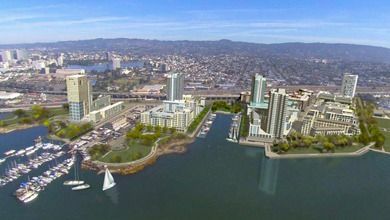 Originally called the "Oak to Ninth development," it was going to be a joint project of Signature Properties and Reynolds & Brown, under the developer Oakland Harbor Partners (OHP). On April 10, 2013, the City of Oakland announced that Signature Development will be teaming up with Beijing-based Zarsion Holdings Group Co. Ltd to develop what they are now calling Brooklyn Basin. "The Oakland Waterfront Development Deal appears to be back on after long delays." "Gov. Jerry Brown has unveiled a $1.5 billion investment partnership between an Oakland-based developer and a China-based investor which will create 10,000 jobs in the state, according to the governor’s press office. Gov. Brown was joined by U.S. Ambassador to China Gary Locke, as well as Chinese dignitaries in Beijing Wednesday to announce the development deal in which the city of Oakland stands to benefit greatly. From the deal, Oakland will see the creation of 3,100 units, 200,000 square feet of retail and commercial space as well as 30 acres of parks and open space. Ground breaking for the project is expected to begin in 2014. The Brooklyn Basin investment deal between China’s Zarsion Holdings Co. Ltd. and Signature Development Group will “dramatically improve Oakland’s waterfront” according to Gov. Brown. Brown had supported Zarsion Holdings during his tenure as Oakland’s mayor, although a press release issued by Brown’s office credited Oakland’s current Mayor Jean Quan as being instrumental in connecting the investors and developers involved. On Wednesday, Brown also signed symbolic agreements on boosting trade between California and China and helping the world’s most populous nation improve its air quality. The Port of Oakland was paid $18 million for the land; cleanup and construction costs are unknown at this time. "The Ninth Avenue Terminal, originally built in the late 1920's and added to in the 1950s, was designed for break-bulk cargo (cargo that cannot be moved in a container). Historically, much of the Port of Oakland's cargo was break-bulk, but today, less than 5% arrives on a break-bulk ship." "Noting that the need for the Ninth Avenue Terminal as a break bulk site had diminished significantly, the Port of Oakland worked with BCDC to determine if the Port Priority Use designation could be removed from 9th Avenue Terminal area. BCDC agreed and removed this designation, which was one of a number of changes that enabled the Port of Oakland to enter into a contract with Oakland Harbor Partners (Signature Properties and Reynolds and Brown) for sale of the roughly 64 acres of land involved in the proposed project." "The project area falls within the scope of the Estuary Policy Plan, which specifies land use objectives for the entire area." Residents of 5th Avenue Marina have released a video against this development, specifically stating that it violates the Estuary plan. Computer generated drawing of Brooklyn Basin when it's done.